Getting Ready for Climate Change: How Ready Are We? Climate change poses significant challenges to everyone on the planet so it may seem a mystery as to why we are still so unprepared to deal with these challenges, but also why we have managed to overlook so many of the opportunities that it presents such as the growing market in renewable energy. Planning has been sorely lacking on this subject to date, throughout all sectors, and although significant progress is now being made there is still a lot of ground to make up. Given our relatively poor level of adaptation to date you would be forgiven for thinking that we have only discovered the effects of CO2 on global temperatures relatively recently, but we have known about this relationship for over 100 years. Swedish scientist Svante Arrhenius first calculated the relationship between CO2 and temperature in 1896 and one of the first truly convincing modern papers on climate change was published by James Hansen et al., in 1981. 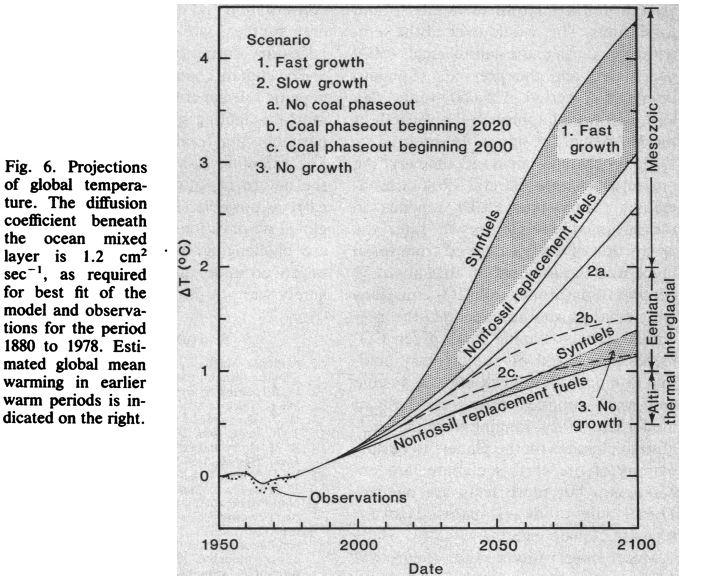 Hansen’s predictions (Figure 1) match up surprisingly well with observed increases in temperature (Figure 2) yet little attention has focused on dealing with climate change until almost 20 years later. Figure 1, taken from: HANSEN, J., JOHNSON, D., LACIS, A., LEBEDEFF, S., LEE, P., RIND, D. & RUSSELL, G. 1981. 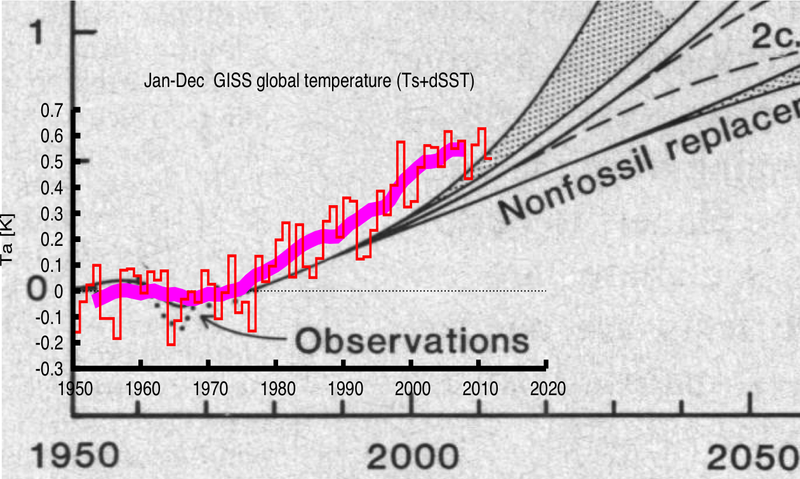 Climate Impact of Increasing Atmospheric Carbon Dioxide. Science, 213, 957-966. There are excellent reasons for society not to act: firstly, there was debate about whether climate was actually changing and if it was changing because of human action. But now the dust is settling on these questions and even people debating whether humans are increasing global warming accept that warming is still occurring: we find ourselves in a global economic downturn. This is the second reason for little action as building resilience into anything means spending money. However, we now have a strong understanding of the challenges presented by climate change, even observing some of the effects already. This means that we can clearly identify the threats to our businesses, homes and communities and spend much more wisely on reducing those risks. Preparing for the future means preparing for uncertainty but, regardless of your opinion on the nature of climate change, risk academics are clear that modest preparation for future events now will far outweigh the cost of damages resulting from no preparation at all (Yohe, 2009). The future is never certain and resilient planning always needs contingencies to address unknown future events and climate change requires the same level of care in planning as any other unknown. The major problem, however, is that we are learning more about climate change every day and although the Intergovernmental Panel on Climate Change’s reports are useful for political decision makers, they are too unwieldy to steering a small business in the right direction. A small business is much more agile and can take advantage of the latest information available and could learn much from how businesses such as banks are tackling climate change. They obtain the newest information available to make sure that they are ready for the challenges and that they identify the opportunities that are always found when changes occur. However, you don’t need the resources of a bank to get the best information possible you can also prepare for the challenges of climate change by getting climate change risk management specialists such as Climate Vision to do a Phase 1 Climate Change Risk Assessment on your business to identify any possible challenges your business could have with climate change and also to identify opportunities. ARRHENIUS, S. 1896. On the Influence of Carbonic Acid in the Air upon the Temperature of the Earth. Philosophical Magazine and Journal of Science, 9, 237-276. HANSEN, J., JOHNSON, D., LACIS, A., LEBEDEFF, S., LEE, P., RIND, D. & RUSSELL, G. 1981. Climate Impact of Increasing Atmospheric Carbon Dioxide. Science, 213, 957-966. YOHE, G. 2009. Toward an integrated framework derived from a risk-management approach to climate change. Climatic Change, 95, 325-339.